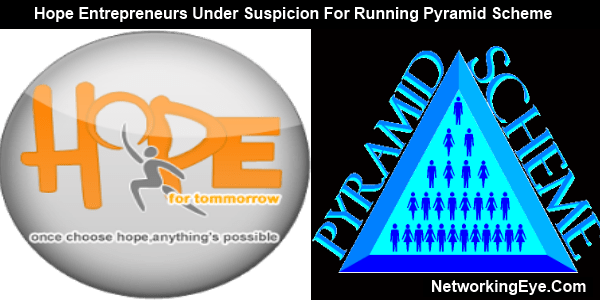 Well-known MLM leader Mehdi Rizvi has claimed that Hope Entrepreneurs Pvt Ltd have been running a hidden pyramid scheme. According to Rizvi the Hope group have been manipulating and luring people for profits in the name of multi-level marketing. Rizvi also mentioned in his information for his followers to not use this company’s plan as later it may result hazardous. The chief operators of the company according to Rizvi are Darshan Somaiya and Shahnawaz Sumrani. They claim for Hope group to be a multi national company but till now there has not been any trace of the group outside India. Rizvi stated there is more nuisances running inside the company that haven’t been discovered yet but soon it will be all visible. Below are some complaints registered against the Hope group which have been viewed. “My personal experience was really bad with this company and I would request from investors to not get involve in this group’s plan. I have necessary proofs for helping in the investigation. Hats off to people deceived by darshan somiya, he repeats one speech word to word and again and again and he has prepared such a great speech that youths will be deceived, he is showing you all fake dreams he is giving you fake “HOPE”, he is using all of you to make his business work, keep up make some money for him and don’t concentrate on your future, I have attended his seminar because he trained my friends how to fool people and drag them to my seminar “LIFE CHANGING SEMINAR” at cost of Hundred rupee entry pass, at the end of the seminar he also gave tips to drag some others in, His products might be good I have no idea, but the type and the way of marketing he is doing – totally wrong . At last I have nothing to deal with him or those people who are already into this, It is your life and time spend wherever you want, I spared some of my time to tell you the truth that you missed to see when his own people welcomed him during well planned BIG-SHOT entry, claps at focused punch lines and many other things, well after reading this some of you may change your mind and focus on good things and many of you might not get into this in future . I HOPE my words will make some difference to you and you will stop chasing blind hope for tomorrow . please don’t give any nonsense comments supporting your faith in hope .